Beginner? No problem. Instructions in every box & How-to videos on our website. Put over-priced coffee shops behind! Be your own Barista - straight, twist of lemon, sugar? Designed for a premium coffee experience , your 6 cup aluminum stovetop espresso coffee maker from MateoJo serves you in the traditional old-world style, now with fun! Based on a traditional design, it is a time proven preference for a truly great coffee - makes 6 doppios (2 ounce shots)! The playful bicycle bean packaging makes a great presentation for a gift. It's fun to receive . Very easy to use. Detailed instructions are included in every box and great support from MateoJo is always available. You get full access with instructions, tips, recipes, and more. Plus an 800 number and web access for easy support. Everyone will feel like a professional barista starting with the first cup. More than a great coffee maker, you're backed by a 100% No Questions Asked Satisfaction Guarantee available only from MateoJo. ➤Remember coffee when everything was just right! 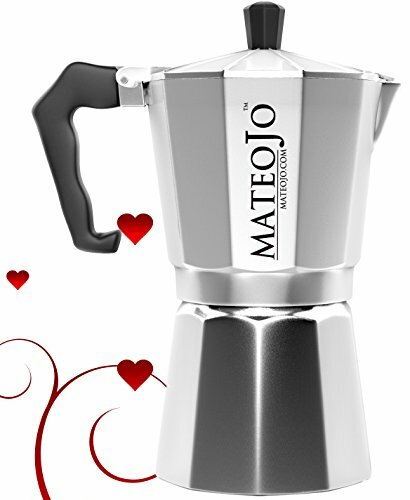 You'll love your MateoJo Stovetop Espresso Maker. Makes six 2-ounce cups (a traditional doppio). It's easy to use - makes your espresso in minutes. Your expresso espresso maker! ➤First time user? No problem. Easy to follow instructions are included in every box plus how-to videos on our website - everything you need. Just place your water in the bottom, coffee in the middle, and heat it up! The top portion fills with a deep flavored mocha brew - just a few minutes. ➤Put over-priced coffee shops behind! Make your favorites - however you like - straight, twist of lemon, sugar? Excellent for so many coffee drinks - americano, lattes, cappuccinos, and more - an old world Italian favorite. Makes great Cuban Coffee. ➤24 Hour email support from a family business that cares. There's an 800 number too! And don't forget it's backed by MateoJo's 100% No Questions Asked Satisfaction Guarantee. ➤Great gift for any coffee lover. A favorite on Valentine's Day! If you have any questions about this product by MateoJo, contact us by completing and submitting the form below. If you are looking for a specif part number, please include it with your message.